I love making fried rice because it's quick to cook, which is a definitely plus for a busy weeknight, it's a great way to use up leftovers, but best of all, it's my clever way to sneaking vegetables into Steven's diet. There, I said it! :) If I took carrots, chopped them up, and stir fried them, Steven wouldn't touch that with a ten foot pole. But there are no complaints once the little cubes are tucked into fluffy rice coated with sausage or duck fat. Not only do different vegetables make the rice look bright and colorful, but they make the dish healthier too! See? Win win! It's not an evil plan. Though I think Steven is on to me now! Today I even snuck in some crownless broccoli stems that have been sitting in the veggie drawer for who knows how long. In the past I've added everything from salted mustard greens to corn. Now peas are something I can't get away with because Steven hates them (he hates tomatoes too! *waits for the collective gasp of the audience*). But you know, I think he just hates frozen peas because honestly, those are nasty and mushy, so I'll have to try adding with fresh peas. I don't think anyone can resist the sweetness of fresh peas. Mua hahaha! Everyone make fried rice a little differently. It's usually made with soy sauce, which provides the salty, savory flavor and brown color. Steven's mom, however, hates dark fried rice so she uses only salt to flavor her rice, but I think this is much too boring. Jaden's secret ingredient is fish sauce, which helps to boost the umami flavor. I like to use oyster sauce for both its umami flavor and the color it gives to the finished dish. It's saltier than soy sauce so you don't need to use as much to flavor the whole dish so the rice ends up being a light golden brown instead of a dark brown. This time I used Chinese sausage, but in the past I've used leftover ham, Chinese bbq pork, and even shrimp and tofu. For an extra special treat, my favorite fried rice is made with leftover Chinese roast duck and cooked in duck fat. I usually try to add a carrot and today I used some broccoli stems, or as I like to call them, heart of broccoli. Makes them sound so much more attractive don't you think? Like heart of palm. After cutting off the broccoli crowns I know a lot of people throw away the stems but you should save them! If you peel or slice off the tough fiberous outer layer, you get a really tender, crisp, and sweet heart of broccoli. This is good in soups, fried rice, or simply sliced and stir fried. 2 cups cold leftover rice, broken up into as small chunks. Rehydrate the dried mushrooms in warm water. Rinse off any dirt stuck in the gills, and chop them finely. 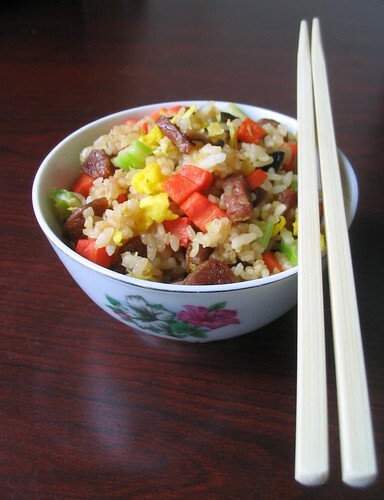 Making fried rice with Chinese sausage includes an extra step of rendering the fat out of the sausages. If you're using with cooked meats like ham, duck, BBQ pork, it should be added towards the end of cooking to heat through but not dry out. Heat a wok or a nonstick skillet over medium heat and add the pieces of Chinese sausage. Cook until the fat has rendered out. Add chopped shiitake mushrooms and stir fry for a minute. Then add the green onions and any other vegetables that you are using. Add a little salt to flavor the vegetables. I like my vegetables to have a good bite left so I don't cook them very long. Stir fry the veggies for a minute. You want to keep the vegetables really crunchy because they will continue cooking as they are sitting in a bowl from carryover heat and then cooked again with the rice towards the end. Transfer the sausage and vegetables to a bowl, keeping any residual fat in the pan. If there's no fat, add 2 teaspoons of vegetable oil. Add the beaten eggs and scramble, cooking until the eggs are half set. Transfer the eggs into a bowl. It's okay to use the bowl you beat them in because you'll finish cooking the eggs fully later (and it's one less bowl to wash). Add a tablespoon oil to the wok or skillet and heat it over medium high heat. Add the rice and break any chunks into individual grains. I use a spatula and press on the chunks of rice until the grains fall apart. Ideally you want all the grains to be separated to get really fluffy fried rice. It's important to use cold hard leftover rice because if you tried this with hot steamed rice, you'll end up with mush. Cook until the rice grains are all separated and hot, about 3 to 5 minutes. They will start to pop off your pan. Add the oyster sauce and a dash of white pepper and stir until it's evenly distributed in the rice. Taste the rice and see if you need to add more oyster sauce. From this point you'll want to work quickly because you don't want the vegetables and eggs to over cook. Add the sausage and vegetables that you set aside earlier and mix this evenly into the rice. Clear the center of the pan by pushing the rice away and add the half cooked eggs. Cook them until they are almost set up, then break up any large clumps and stir them into the rice. Wandering Chopstick made Yang Chow Style Fried Rice, a Chinese restaurant staple. And Jaden makes awesome Spam Fried Rice. And if you're saying "ewww SPAM", don't hate, it's actually quite tasty! I love rice packed with bits of veggies, bacon, chicken... This looks so good! Thanks for posting this one Amy! I couldn't agree with you more, sneaking in veggies, using the stalks of broccoli. My little one hates peas too, but we just planted them in our garden - so I'm hoping he'll learn to like the fresh ones as he sees them grow! I've been known to sneak veggies in where I can too! I love fried rice. Actually i adore them. I love the way you have made them. I make fried rice with oyster sauce, too. And I love the stems of broccoli, more than the florets. I peel and slice the stems very thin, and use them in lots of stir fries. This looks great! I love to make my own fried rice too. When I want to make it, I just stop by the Chinese takeout place on my way home and buy a few containers of their plain rice. It saves me the trouble of making my own in advance. Is fried rice supposed to look this pretty? Oh I love bacon fried rice too! Cooked in a little bacon fat, mmm mmm! Ooh yay, it's awesome that you use the stalks too! They're fabulous in stir fries. That's a great way to do it! Wow, this looks amazing! I've bookmarked it for future dinners. Any ideas for where to get chinese sausage or chinese Bar-B-Q pork? In my china town it's post common to sell the pork within a bun, not separately, but I could just be looking in the wrong place! This looks wonderful, I love all the little bits of different flavors in there :). I've actually been following your blog for awhile now, and I'd love to feature some of your recipes on the Key Ingredient Blog, especially this one. Please let me know if you're interested :). Steven's mum is right: dark fried rice is a usually a sign of an inexperienced or lazy chef/cook and I personally hate seeing this too. Fried rice is one of those dishes that's easy to do but apparently hard to master ... when it shouldn't be and the amount of FUD around here on the net is bemusing to say the least. Typically you don't need to season your fried rice when you're cooking it up as your existing traditional ingredients such as Chau Siu pork (BBQ pork) or Chinese sausage (Lap Cheong), ham etc. and your seasoned wok will impart the necessary flavours and saltiness to your rice. If you need to season it for whatever reason, you can add extra salt or some stock for a bit of nuance. You should notice that the better Chinese restaurants will always have such a beautiful pale fried rice with a hint of a smoky flavour to them since the professional chefs cook with an extremely high heat in a well seasoned wok. Thai fried rice is a bit different because they like adding soy sauce or fish sauce directly into their fried rice or fried noodle dishes as they're cooking it up.